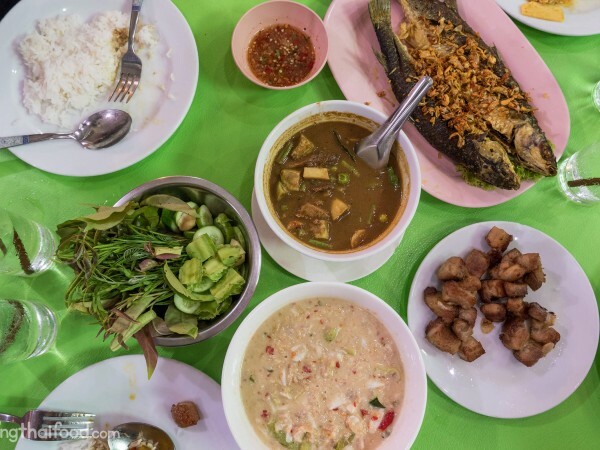 Isaan, the northeastern region of Thailand, along with having an amazing cuisine of its own as we all know very well, is also well known throughout Thailand for its Vietnamese food. From Khon Kaen to Ubon Ratchathani, you’ll find both Vietnamese Thai street food and restaurants available. 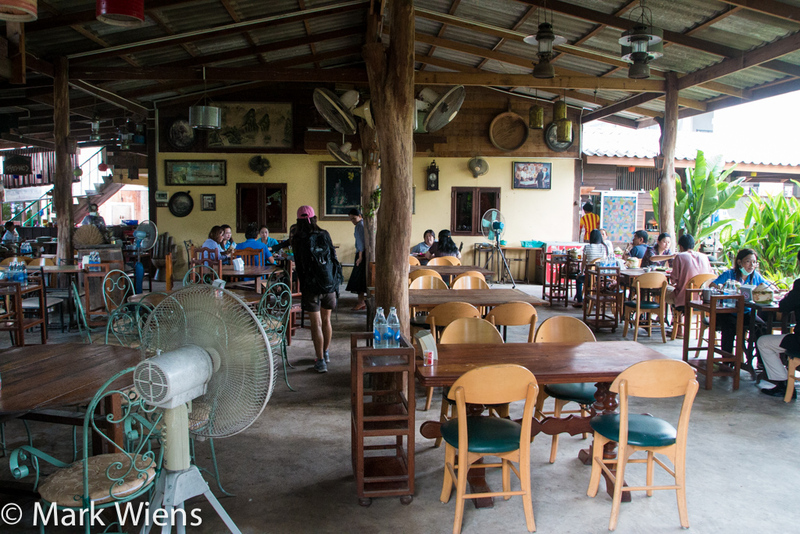 One of the most well known Vietnamese restaurants in Khon Kaen (ขอนแก่น), is Nam Nuong Lablae (แหนมเนืองลับแล), and it’s one of those restaurants that many Bangkok Thais say you haven’t been to Khon Kaen until you eat there. Having just taken a recent trip to Vietnam, and with the hype of the restaurant in Khon Kaen, one day Ying and I decided to go for lunch. 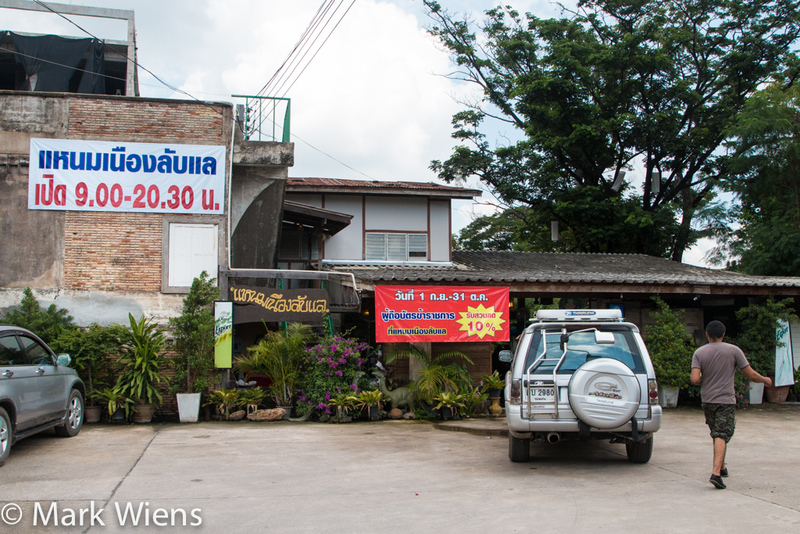 The first thing to note, if you go to Nam Nuong Lablae (แหนมเนืองลับแล) is that the restaurant is a little confusing. On one side of the road is the same restaurant, but it’s a Vietnamese buffet, which I didn’t try. I wanted the a la carte restaurant, because usually a la carte is fresher and the food is better quality. For the a la carte part of the restaurant, you have to go across the street from the buffet side, down a parking lot alley, and at the end of the parking lot you’ll find the restaurant. 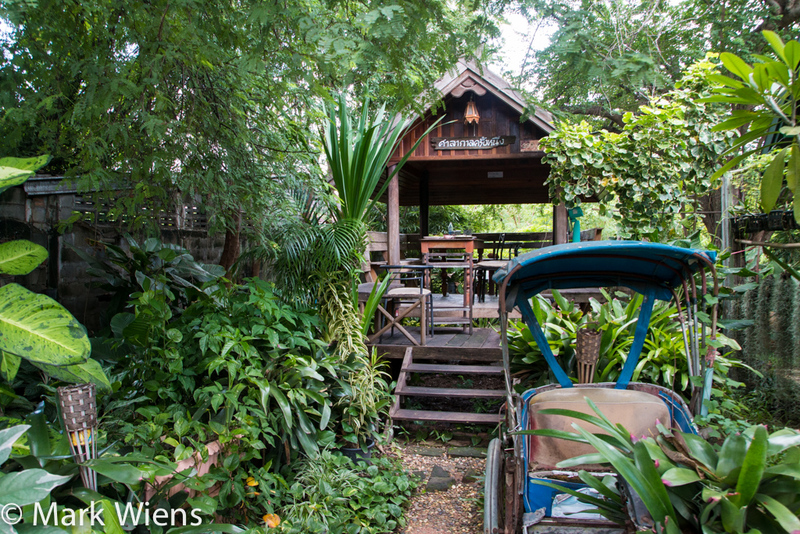 Once inside, the restaurant is actually quite nice, with lots of trees, and decorated with old Thai antiques like wagon wheels, rickshaws, and sewing machines. Along with the main dining room, you can choose to sit at one of the few private cabanas, which is what I chose. I was honestly not planning to order too many dishes, I was looking for just a light lunch the day I went, but once I saw how extensive their menu was, including loads of different Vietnamese dishes, Ying and I couldn’t resist. 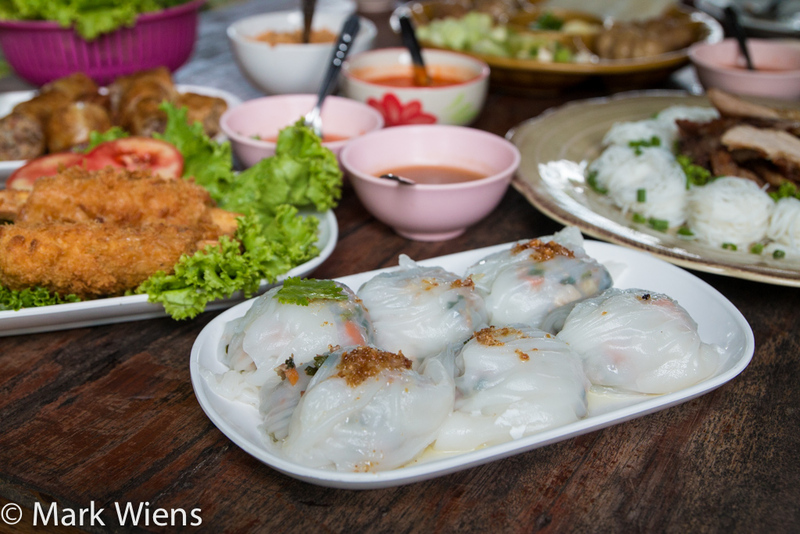 Nam Nuong (แหนมเนือง) is the Thai version of Vietnamese nem nướng, and it’s probably the most well known Vietnamese dish that’s eaten throughout Thailand, especially in the northeastern region, closest to Vietnam. 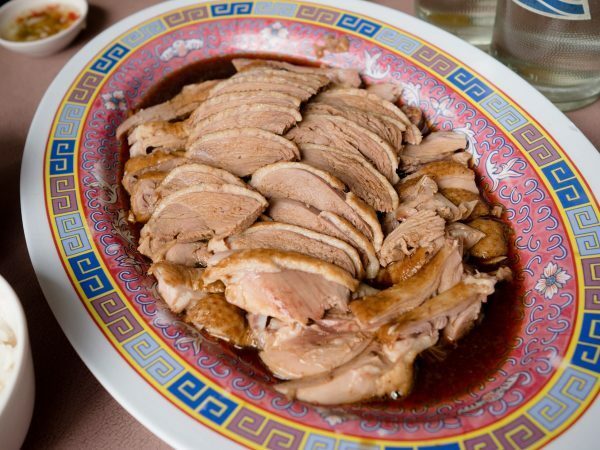 It also happens to be THE must order dish at Nam Nuong Lablae (แหนมเนืองลับแล), and we couldn’t not order it. 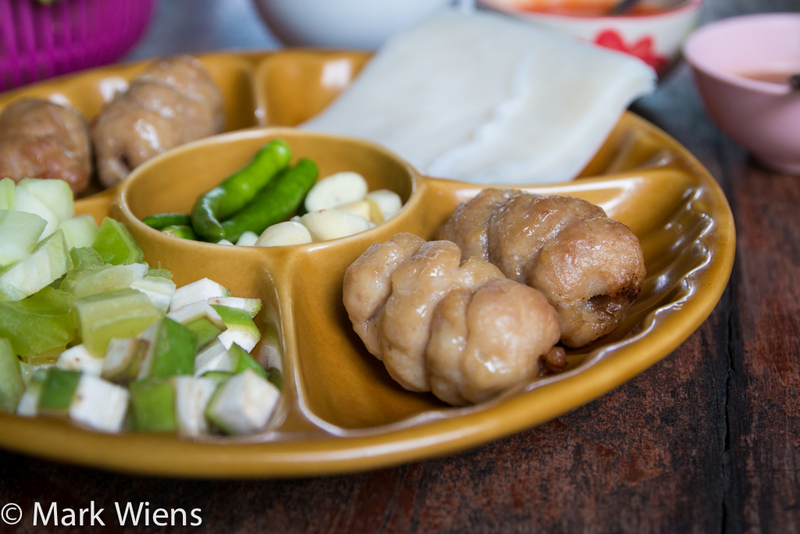 The mixed platter came with four small grilled and seasoned sausage like links, plus the rice paper wrappers, which were already moistened (maybe a little too much so), chilies and garlic, and diced cucumbers, star fruit, and green unripe banana. Additionally there were a couple of different sauces, a straight red chili sauce, a sweet peanut sauce, and some kind of a tamarind sauce, maybe. And finally, a basket of fresh herbs and leaves was also included. 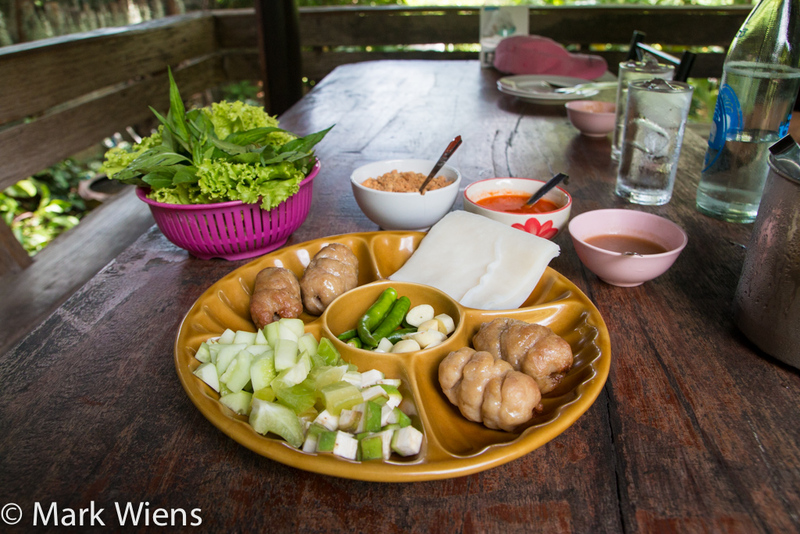 To eat nam nuong (แหนมเนือง), you normally grab a piece of the rice paper, fill it with whatever you like, including some of the sausage, and then dip in whatever sauce you please. I thought the nam nuong (แหนมเนือง) at Nam Nuong Lablae (แหนมเนืองลับแล) was very good, nicely flavored, and both the side vegetables and sauces were well done. The nam nuong (แหนมเนือง) is so famous, many Thais even buy a package of it to go, which you can purchase at the front of the restaurant without even eating there, if you like. 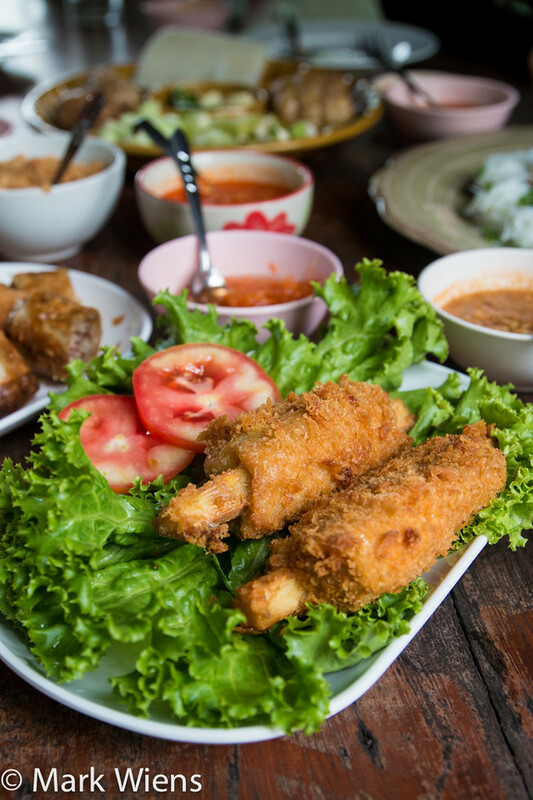 A Vietnamese meal, especially in Thailand, would not be complete without deep fried spring rolls, known in Thai as paw pia tod (ปอเปี๊ยะทอด). The version at Nam Nuong Lablae (แหนมเนืองลับแล) had very good flavor and I thought it was a nice mixture of ingredients, with what I think was a combination of mung bean noodles, minced pork, salt and pepper, and a dipping sauce that was similar to the fish sauce and Vietnamese pickles so common in Vietnam. I thought the flavor of the spring rolls was very good, but I think ours had sat a bit too long before they served them to us, so they were a little stale. So if you get a freshly fried plate, they would have been excellent. 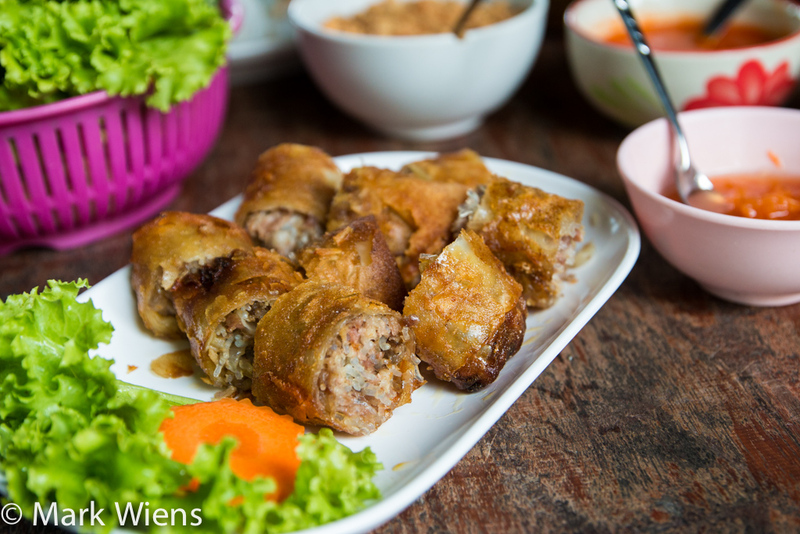 Pak maw (ปากหม้อ) is similar to the Vietnamese banh cuon, steamed crepes of rice flour, filled with a mixture of minced pork and vegetables, and usually eaten with sauce. 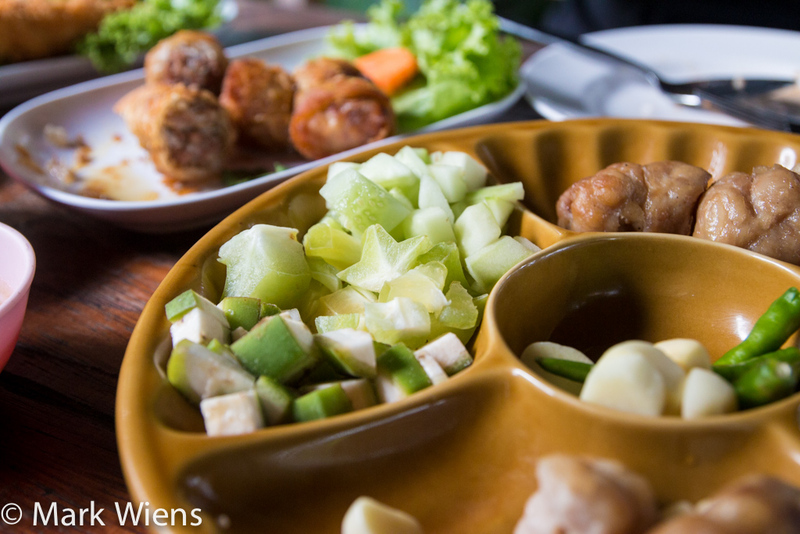 This was one of my favorite dishes at Nam Nuong Lablae (แหนมเนืองลับแล). It was seasoned extremely well, with just the right amount of pork and green onions, and the wrapper was light and fluffy. We also ordered a dish called goong pan oui (กุ้งพันอ้อย), shrimp patties, wrapped around sticks of sugarcane, breaded, then deep fried to a crisp. Overall, though my wife really liked them, it wasn’t my favorite. I thought it sort of tasted like a crispy shrimp hot dog, which could definitely be good, but just isn’t my style most of the time. 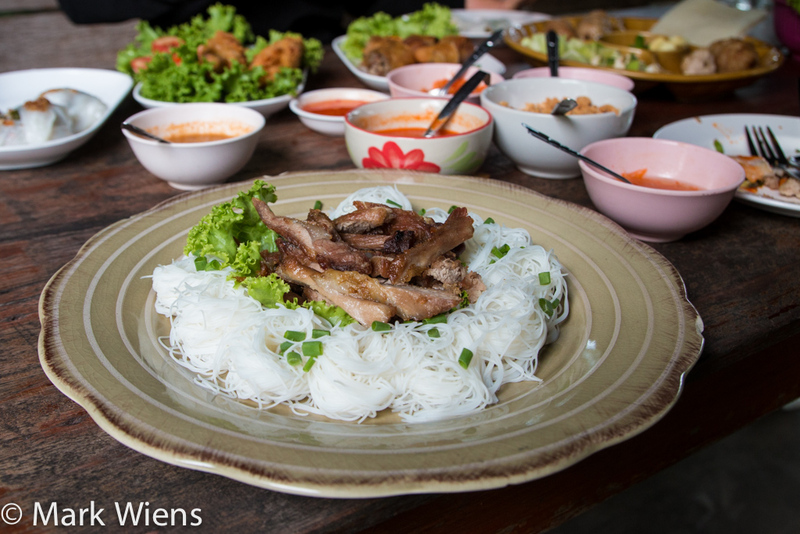 For a bit of a more filling dish, we also got ban hoy moo (บั้นหอยหมู), thin rice vermicelli noodles, topped with grilled slices of pork. The noodles were plain, and the pork tasted quite similar to any recipe of Thai grilled pork neck. Although quite plain, it was good when eaten along with the variety of sauces, dips, and vegetables and herbs provided. 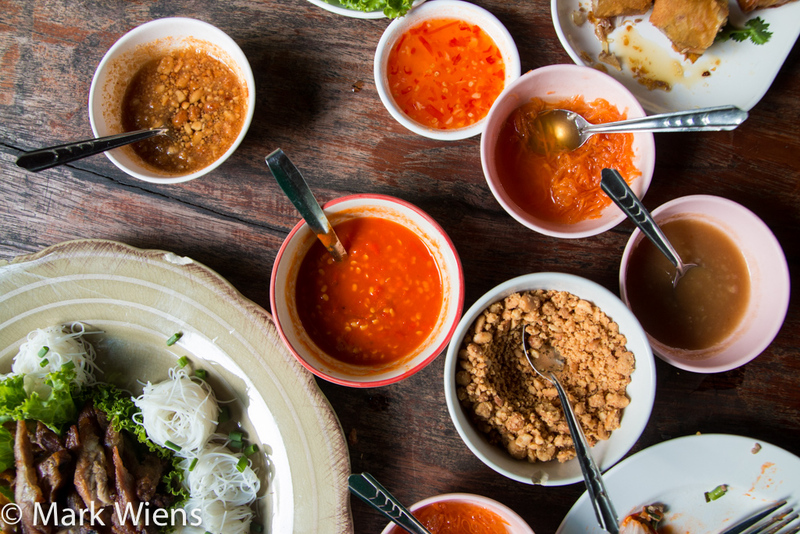 One of the highlights of my meal were all the sauces, which were similar to the sauces in Vietnam, yet a little on the Thai flavor side – perhaps more spicy and more salty overall. The normal Vietnamese sweet fish sauce was salty and sweet, and what I really liked was the chili sauce, which was basically just a purée of red chilies with no added sweetness, and a full bowl of crushed roasted peanuts. The sauces really made our meal delicious. Nam Nuong Lablae (แหนมเนืองลับแล) is the most well known Vietnamese restaurant in Khon Kaen, a restaurant that many Thais must eat at if they visit the city. The restaurant has both a buffet and an a la carte section, and I chose to eat at the a la carte part, a very nice antique style restaurant. 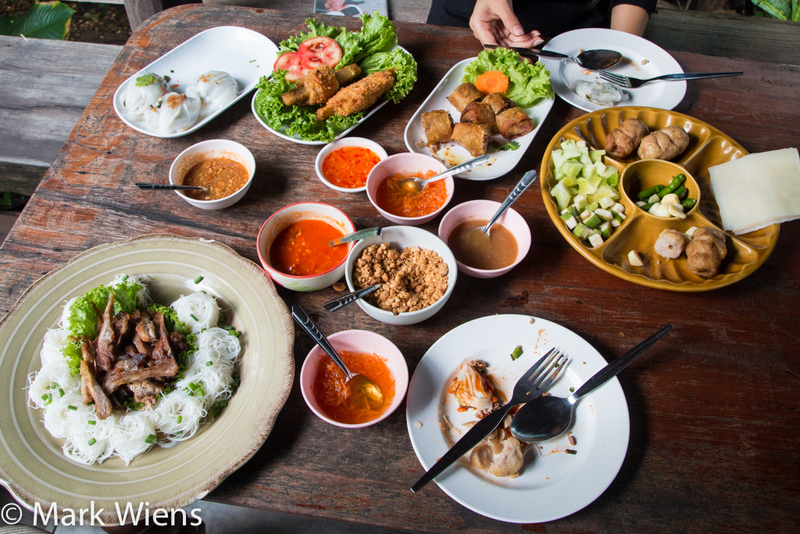 The menu was extensive, including quite a variety of Vietnamese dishes, and their signature dish: nam nuong (แหนมเนือง). 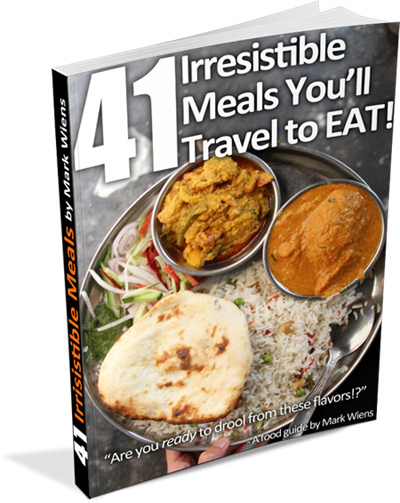 I thought the food was very good, the vegetables were fresh, and the flavors were overall delicious. If you visit Khon Kaen, Nam Nuong Lablae (แหนมเนืองลับแล) is a great restaurant to eat at, it lives up to its name. เปิดบริการทุกวัน 10.00 – 21.30 น. 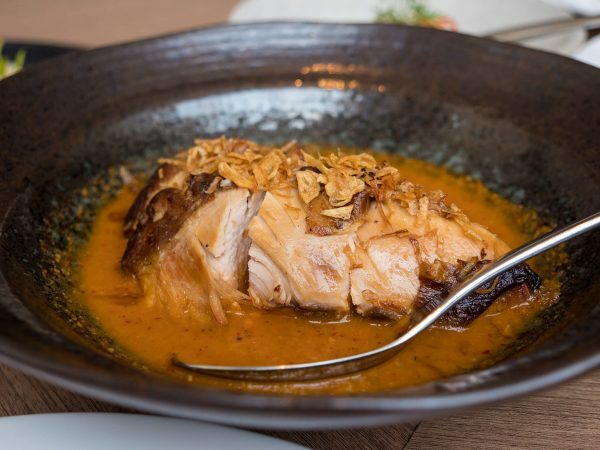 How to get there: The restaurant is located on Klang Mueang road, where you’ll find a large influence of Vietnamese cuisine. When I was last in Khon Kaen, I stayed at Phanthipha Residence (affiliate link), and it was just a 10 minute walk from there. Scroll down to “Isaan,” then find Nam Nuong Lablae (แหนมเนืองลับแล) and click that, and it should take you to the location on the map. This looks so delicious! Love the photos.